The lack of planning is the primary reason most SharePoint initiatives end in disaster. Imaginet's SharePoint Assessment & Planning services will help you get your SharePoint right, the first time. Imaginet’s 5-Day SharePoint Assessment & Planning Workshop is only $10,000. Schedule Today! Imaginet's 5-Day SharePoint Assessment & Planning Workshop ensures you will receive the most value out of your SharePoint investment and avoid costly implementation mistakes. Did you know that the lack of planning is the primary reason most SharePoint initiatives end in disaster? Without a proper upfront strategy and roadmap, your SharePoint solution is at greater risk for experiencing system downtime, security breaches, corrupted information, long-term maintenance nightmares…. and especially end user frustration. Most organizations lack the experience to know how to thoroughly plan a successful SharePoint initiative. Whether you’re deploying, upgrading, migrating, or kick-starting a new SharePoint project, Imaginet can help you get off on the right foot. With 1200+ happy clients over the past 20 years, Imaginet is your trusted, go-to partner for all your SharePoint Assessment & Planning needs. Get Your SharePoint Exactly Right… the First Time. leverages our Imaginet SharePoint Business Discovery Methodology™ and takes customers through the process of discovering the exact requirements within their organization, then layers our unique visioning and planning roadmap across the requirements to fully understand the expectations of the SharePoint initiative and what success looks like for your organization. At the conclusion of the workshop, you will receive your SharePoint Assessment & Planning Report containing (1) information gathered from the workshop and (2) a phased roadmap with step-by-step guidance on how to make your SharePoint initiative a complete success. With the incredible power and flexibility of Microsoft SharePoint comes complexity and the need to work with a Microsoft Partner that has a proven track record of success. Not only has Imaginet executed hundreds of SharePoint projects for some of the largest companies in the world, but we have significant SharePoint expertise that ensures your SharePoint initiative is done the right way, the first time. 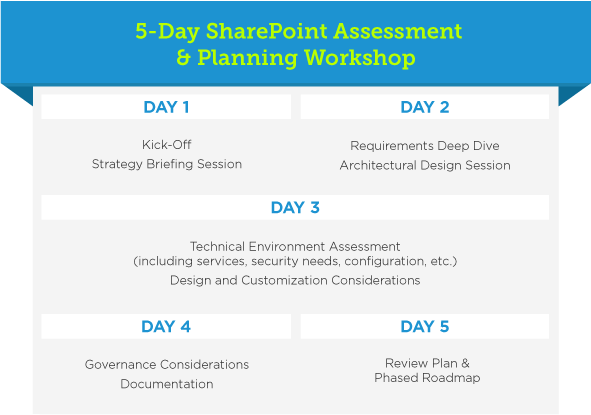 Although this 5 day SharePoint Assessment & Planning Workshop targets a single SharePoint initiative, it can be used as the foundation for large enterprises with multiple or complex SharePoint scenarios that may require additional days. Imaginet has been at the forefront of the industry for almost 20 years, delighting over 1,200 customers worldwide. SharePoint Assessment & Planning Services offered worldwide.